We announced a couple of months ago that we were going to start working on one or two job-board integrations. The goal was to make setting your Weirdly quiz loose on the world (and attracting in those top-shelf applicants) as easy and smooth as possible. So, many red-bull fueled hours and complicated flow diagrams later, we’ve set the first of these live. You can now launch your quiz and post it directly to TradeMe Jobs without ever leaving the comfort of your Weirdly home. We’re stoked to be popping our integration-cherry with the dudes at TradeMe. They’re an awesome, home-grown platform and with 54,000 roles listed in just the first quarter of this year, they’re a big presence here in NZ. You’re in luck! It’s extra easy for you. Once you’ve built your Weirdly quiz, continue onto our distribute page and select the TradeMe Jobs badge from the list of sourcing options. Select the “Post using my account” option and enter your TradeMe Jobs login and password. Congratulations! Your Weirdly and TradeMe accounts are now linked. You can edit your ad, which automatically pops up pre-populated with all the job description details you entered into Weirdly, and press submit whenever you’re ready. Crack a beer and lean back, your job is now live on the TradeMe Job board– no waiting, no annoying double-entry of info. 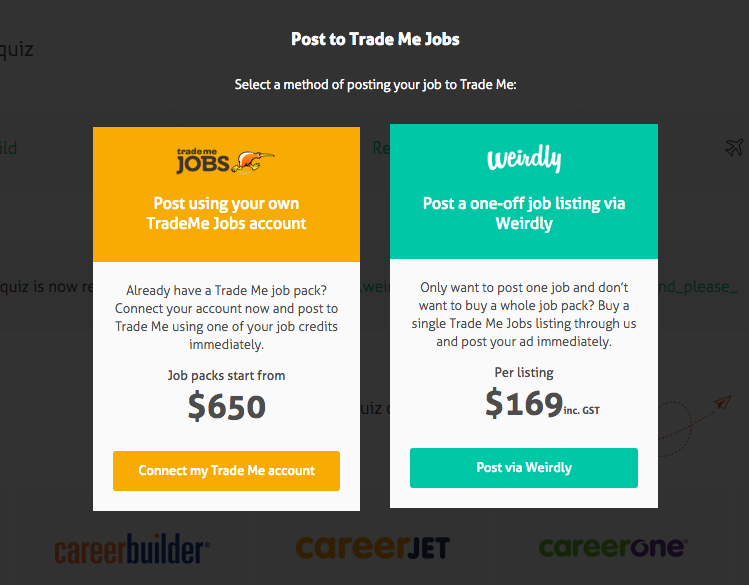 You can edit your job ad at any point by clicking on that TradeMe Jobs badge again, and once your Weirdly job expires, the ad will automatically be pulled down off TradeMe too. You’re still in luck! It’s only one tiny extra step for you. The process is the same as for our TradeMe Jobs account-holders, but after selecting the badge on our Distribute page, you click “Post a one-off job” option. Basically this just means you’re able to buy one job at a time – heaps cheaper than buying a whole job pack. The TradeMe ad form will pop up, automatically populated with the same details you entered into Weirdly when you were building your quiz. Make sure these are all good and add any extra bits and bobs you may want. Then pop in your credit card details and you’re away! Just like with the account holder guys above, you can edit your job ad at any point by clicking on the TradeMe Jobs badge again. Once your Weirdly job expires, the ad listing will automatically be pulled down off TradeMe too so you don’t need to worry about logging in and manually pulling it down. Have a play around, set some TradeMe ads live and tell us how it goes. In the meantime, we’ll keep smashing out the code and let you know when the next big feature or integration addition drops.